Michael M. Jones (ed. 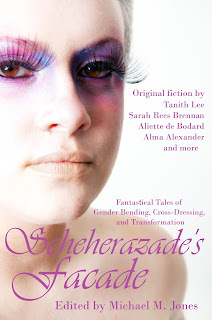 ), Scheherazade's Facade: Fantastical Tales of Gender Bending, Cross-Dressing and Transformation. Gressive Press, 2012. 527KB. ASIN B009YZWX3E. $7.16. Scheherazade’s Façade: Fantastical Tales of Gender Bending, Cross-Dressing and Transformation is an anthology that targets readers of the LGBT community who enjoy reading fantasy. Released by Gressive Press, an imprint of Circlet Press, the stories within pursue the challenges and triumphs of those who live within the LBGT community, both on Earth and places more mystical. 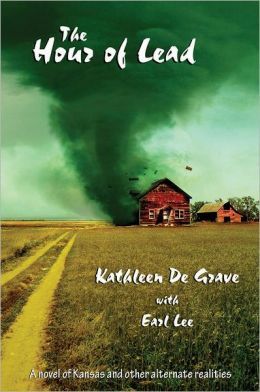 Kathleen De Grave with Earl Lee, The Hour of Lead. See Sharp Press, 2012. Pp. 255. ISBN 9781937276270. $14.95. The Hour of Lead is an earnest novel, published by the anarchist and social activist See Sharp Press, with science fictional themes including corporate dystopia and time travel, with a nod to the Butterfly Effect, but written by an author with no evident background in science fiction literature or fandom. Set in a near future Kansas facing environmental collapse where an unfettered capitalist corporation-government runs the world to neocon wet-dream principles, with a psychiatrist as protagonist and his astrophysicist wife as deuteragonist (for although many scenes are told from her perspective, she is clearly second fiddle in this book), the novel demonizes not only free-market capitalism but also nanotechnology and other invasive environmental and medical sciences. There are several problems with this story, from characterization to plot contortions and false-dilemmas driving the action, but it is an engaging read, and it does succeed at the authors’ stated aim which is to present moral quandaries without offering any easy answers. Splatterpunk Zine #2 (2013). Pp. 40. £2.99. Splatterpunk is a sub-genre of horror. It is, as many genres are, difficult to define exactly but the tone of this, the second issue of a lively little magazine dedicated to the art form, is horror that often involves people rather than monsters (in the traditional sense). It is no-nonsense and straightforward, but his doesn’t mean that the literary tone of Splatterpunk magazine is poor, by no means. All the stories, reviews and interviews are well written; the fiction is logical and character-driven. The prose itself is direct, cut to the bone—as are many of the protagonists—and compelling. This magazine exudes energy and enthusiasm; it is a labour of love. A quote on the cover by horror writer Wrath James White states that Splatterpunk makes him “nostalgic”, and I understand what he means. This is a true small press production: short, sharp, well-illustrated and with the feel of the homemade, although far from homemade in quality.